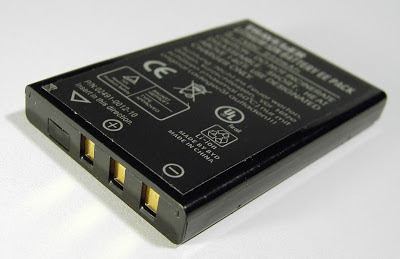 Lithium Ion batteries are ubiquitous in the world today. Most, if not all, electronic devices run on lithium ion batteries. Even electric powered cars run on these kind of batteries. Li-ion batteries are popular because of their proven track record in long battery life and battery performance due to their energy density slow loss of charge when not in use. These batteries can be used individually or arranged as part of a group of cells to power electric or hybrid vehicles. The anode and the cathode are hooked up to an electrical circuit attached to the device being powered. A battery gives of electrical energy when ions from the anode travel to the cathode. When the ions move from the cathode to the anode, the battery is recharged. In both ways, the ions pass through the electrolyte. The faster the ions can move to the anode through the electrolyte dictates how quickly the battery can be recharged. Graphite is used as the material for the anode but only allows one lithium atom to pass per six carbon atoms. Prior to graphene, silicon was the material of choice since it allows four lithium atoms to pass per one silicon atom, giving it a faster recharge cycle. Video: Lithium-ion batteries: How do they work? The team led by Rice engineer Sibani Lisa Biswal and research scientist Madhuri Thakur reported in Nature's open access journal Scientific Reports on the creation of a silicon-based anode, the negative electrode of a battery, that easily achieves 600 charge-discharge cycles at 1,000 milliamp hours per gram (mAh/g). This is a significant improvement over the 350 mAh/g capacity of current graphite anodes. "We previously reported on making porous silicon films," said Biswal, an assistant professor of chemical and biomolecular engineering. "We have been looking to move away from the film geometry to something that can be easily transferred into the current battery manufacturing process. Madhuri crushed the porous silicon film to form porous silicon particulates, a powder that can be easily adopted by battery manufacturers." Because of the fragmentation that occurs in the battery when silicon is used, graphite has always been the standard material despite it being inferior to silicon. But even those films presented a problem for manufacturers, Thakur said. "They're not easy to handle and would be difficult to scale up." But by crushing the sponges into porous grains, the material gains far more surface area to soak up lithium ions. 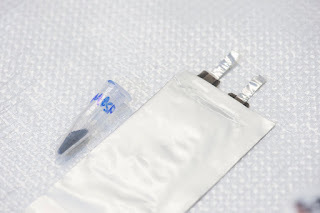 Biswal held up two vials, one holding 50 milligrams of crushed silicon, the other 50 milligrams of porous silicon powder. The difference between them was obvious. "The surface area of our material is 46 square meters per gram," she said. "Crushed silicon is 0.71 square meters per gram. So our particles have more than 50 times the surface area, which gives us a larger surface area for lithiation, with plenty of void space to accommodate expansion." The porous silicon powder is mixed with a binder, pyrolyzed polyacrylonitrile (PAN), which offers conductive and structural support. "As a powder, they can be used in large-scale roll-to-roll processing by industry," Thakur said. "The material is very simple to synthesize, cost-effective and gives high energy capacity over a large number of cycles." "This work shows just how important and useful it is to be able to control the internal pores and the external size of the silicon particles," Wong said. A half-cell battery that incorporates a porous silicon developed at Rice University has achieved more than 600 charge-discharge cycles in the lab. The work holds promise for next-generation batteries for electric vehicles. "This successful endeavor between Rice University and Lockheed Martin Mission Systems and Sensors will provide a significant improvement in battery technology by the development of this inexpensive manufacturing technique for silicon anode material," said Steven Sinsabaugh, a Lockheed Martin Fellow who works with LANCER and a co-author of the paper along with Lockheed Martin researcher Mark Isaacson. "We're truly excited about this breakthrough and are looking forward to transitioning this technology to the commercial marketplace." "The next step will be to test this porous silicon powder as an anode in a full battery," Biswal said. "Our preliminary results with cobalt oxide as the cathode appear very promising, and there are new cathode materials that we'd like to investigate."